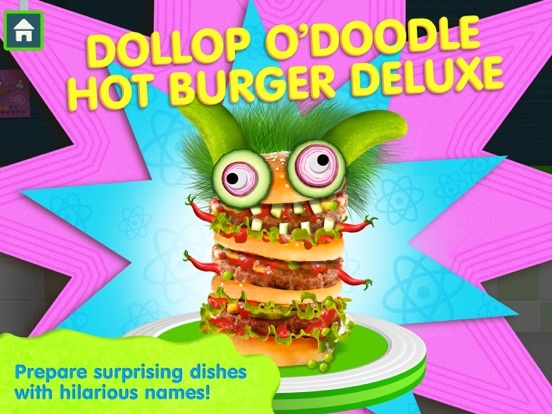 The wildly popular Tiggly Chef is back! 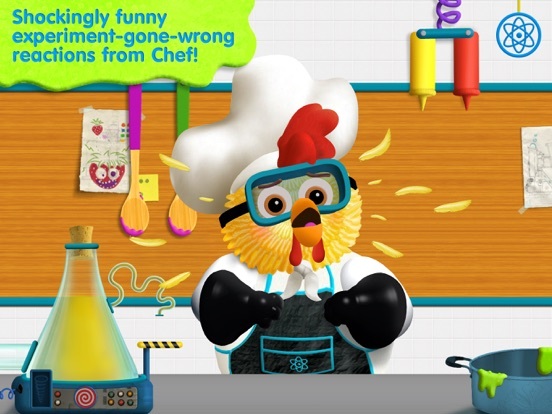 This time, join Chef to learn subtraction math concepts while experimenting in his super-duper secret kitchen laboratory, to create the most silly and flavorful creations the world has ever witnessed! 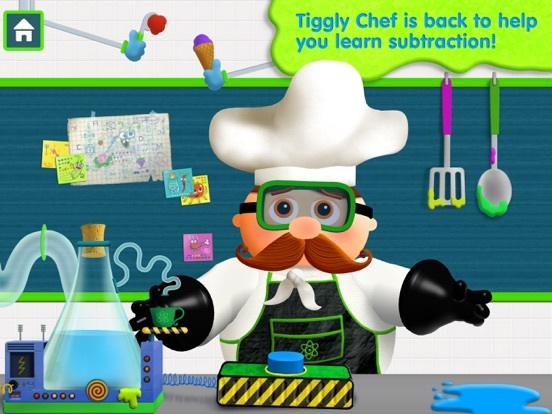 Tiggly’s most mustachioed master Chef invites you to his super-duper secret kitchen laboratory to try out new ideas and inspirations for his preposterously tasty dishes! Chef tells you what’s needed for each experiment, and you help by taking away the extra ingredients to get to the exact number called for by his lab notes. Mathematics symbols appear on screen explaining your actions, helping you naturally learn subtraction concepts and the meaning behind mathematical symbols as they relate to your own actions. Chef will encourage you to follow instructions and think flexibly! 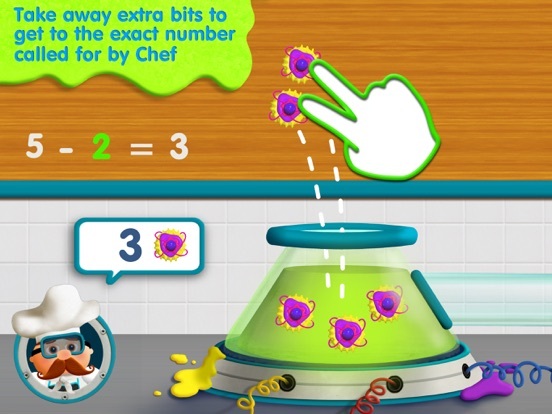 We highly recommend you to also play with Tiggly Chef addition app -- 100% free without any in-app purchases. FREE Download of Tiggly Chef stickers for iMessage is included. -	24 surprising dishes with hilarious names like “Pickle Me Garlic Riddle Me Do”! -	12 shockingly funny experiment-gone-wrong reactions from Chef! Imagine Chef with a tiny blueberry head! Your child can come up with their own instructions and math problems by designing custom recipes. They decide what ingredients they would like to experiment with and how many of each ingredient is needed. To add Tiggly Chef stickers to your iMessage, tap on the App Store icon beside the chat field, tap on "Manage" tab at the top, and turn on Tiggly Chef stickers! The Tiggly team has PhDs, MBAs, parents, grandparents, uncles, and aunts who want to help parents introduce their children to the digital world in an easy yet educational way. Our educator-designed tablet toys interact with learning apps because we believe there is a powerful learning opportunity in the combination of physical and digital play. 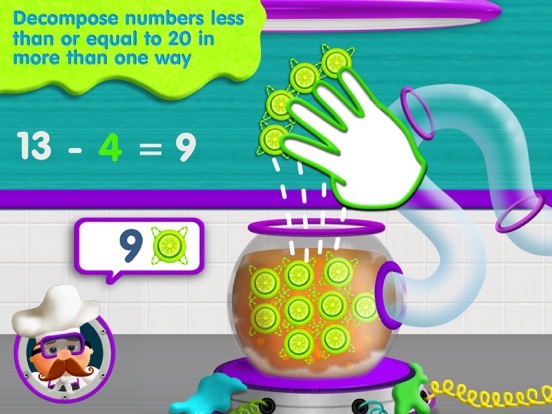 Children explore mathematical concepts and numerical relations by manipulating physical number blocks while playing in wonderful digital worlds that stretch their imagination and spark their creativity. Our team collaborates with Grammy and Emmy-award winning creative talent to craft products that parents and children both love. Tiggly products are available in 20+ countries and in more than 300 Apple Store locations across four continents, Amazon, and specialty retailers worldwide.